Create bots quickly by capturing the keystrokes and mouseclicks you want the bot to replicate by using one of the built-in screen recorders. You also have the option of creating or editing bots manually with the Task Editor. Typical end-to-end processes include a series of tasks, both repetitive and complex. Standalone RPA only addresses the repetitive tasks. IBM Business Automation Workflow Express is included in IBM RPA with Automation Anywhere Express to address this gap, unlocking the true value of RPA by allowing users to deploy bots within orchestrated workflows. 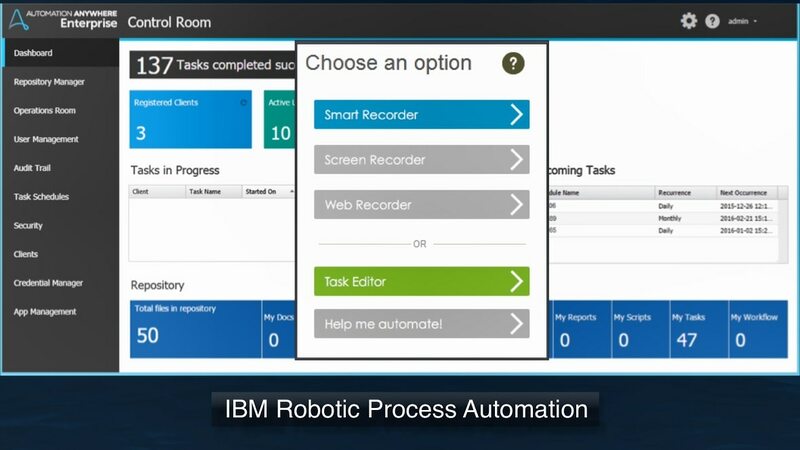 Built to extend the value of standalone robotic process automation, IBM RPA with Automation Anywhere Enterprise is enhanced with IBM DBA Express, unlocking additional automation capabilities. Orchestrate your digital workforce with IBM Business Automation Workflow, make bots smarter with IBM Operational Decision Manager, integrate unstructured data into business applications with IBM Data Capture and manage your organization's content and documents with IBM Filenet Content Manager.